The NVRS series of night vision riflescopes continue to garner rave reviews from top shooters around the world. Built on a military-grade titanium body, the NVRS provides an exceptionally strong, lightweight foundation for its high-res image illuminator tube and precision coated optics. The NVRS 2.5x50 provides comfortable viewing with a 15 degree field of view. 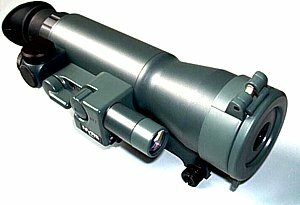 The unit's 50mm objective lens is one of the largest objective lens in use and provides outstanding light-gathering capabilities. The Gen 1 image tube works well with moonlight and starlight, but Yukon's exclusive built-in PULSE Infrared (IR) Illuminator with a range of 100 m extends the NVRS' viewing range. The PULSE system utilizes quick infrared energy bursts that pierce the darkness further to increase distance, visibility and image quality. The PULSE IR System provides the highest level of infrared illumination without significant battery drainage. The same “pulsing” frequency that is invisible to human eyes infiltrates longer distances due to the Infrared Illuminator's quick energy bursts. The unit is powered by two AA batteries and is turned on by a flip of a switch. The unit can also be turned on by using the NVRS's on-off switch, which can be easily placed on your rifle or any other place nearby for easy access. This makes it possible to activate the scope without removing your hands from the rifle. Even the rubber eye shade has been well thought out. 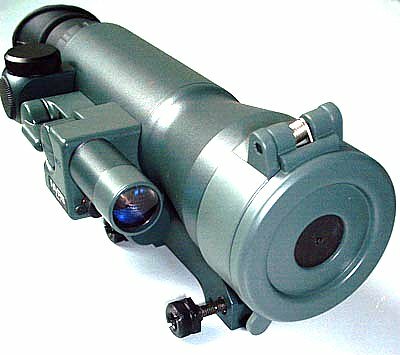 Its oblique shape provides comfortable viewing and it provides an excellent shield - it keeps the night vision unit's green glow hidden from animals and observers. The 45 mm eye relief provides protection during a rifle's recoil and even more comfort for those that wear eye glasses. Night vision riflescopes need to be adaptable, so by adding various accessories, the NVRS 2.5x50 is transformed to adapt to any situation. Magnify surrounding sounds with the Directional Sound Amplification System (DSAS). DSAS magnifies sounds within a 110 yard (100 meters) range, and varmint hunters around the world favor the DSAS paired with a weaver mount to uncover even the slyest varmints. Double magnification with the new NVRS 50 mm doubler lens, and add the IR Flashlight for extra light. The IR flashlight is equipped with a honeycomb filter to provide illumination without detection. For more versatility, use the weaver base/side mount adapter to simplify dual applications when using an AK/SVD rifle. And for even greater versatility, the NVRS includes a weaver plank for an easy addition of the Yukon digital camera adapter (SKU # 29023) to convert your riflescope to a high-end night vision camera unit. The retical can be turned off to provide a clear field of vision during your photo shoots.